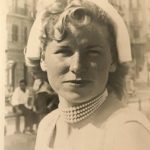 Marianna O’Brien Marder, 92, Entered her Heavenly Home on Tuesday, April 2, 2019 at 10:30am. Marianna was Born May 28, 1926 in Brunswick Georgia, She was a member of St. Joan of Arc Catholic Church in Yorktown Va. Marianna Loved Life and always enjoyed helping others in so many ways, she loved to Hug Everyone and she loved to dance, and she loved animals. She was a Giver in so many ways. Marianna has done so many things in her 92 years of life, she was involved in the Neighborhood Watch, a Girl Scout Leader, and she worked for the American Cancer Society for many years, she was also involved in the RCIA in the Church some years ago. She was a Loving and Caring Wife, Mother, Grandmother, and Friend. Marianna was the Oldest of 11 children (9 brothers, 1 sister) to Joanna and Joseph O’Brien of Georgia. She was preceded in death by her Loving Husband of 61 years Calvin Marder. Left to Cherish her memories are 5 children, Linda, Carol, Judy (Eddie),Lori (Mark), and Michael 3 Grandsons, Steve (Molly), Justin, and Eric, and 1 Great grandson, Zane, and a host of Nieces, Nephews, Cousins, and Friends. A Service will be held at St. Joan of Arc Catholic Church, 315 Harris Grove Lane, Yorktown Va. Friday, April 12, 2019 at 10:00am, Arrangements by Amory Funeral Home, Grafton, VA.